Hallie told me she wants me to sew her a “puppy” picture for her birthday, using her favorite colors – purple, red and green! It’s really hard to find a free puppy xstitch chart. I’m not good at drawing real things, let alone graphing them for stitching. I can do some flowers, but not a puppy. Anyway, I finally found one, and I charted it and some red and purple flowers in green grass. It should work up pretty quickly, though. For Katie’s Christmas present, I’m going to try to make her an “angel baby” doll. 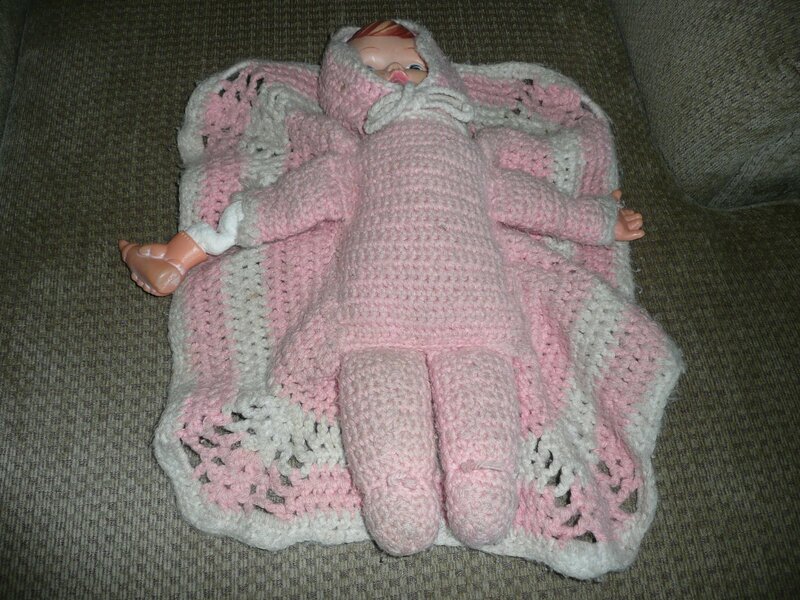 My auntie used to make these – I remember she had a case full of them at her house, so any little girls who came to visit would at least have a doll to play with while there. I found my angel baby (see picture) in one of the boxes that got wet this weekend, and Katie didn’t even care that it’s falling apart. The styrofoam “skull” fell out a long time ago, and one of the hands is completely loose, but she sat and gently cradled the baby’s face and “fed” it with the bottle in the loose hand. It was so great because the baby’s blanket is attached to the body (it looked like angel wings to me, thus “angel baby”) – no lost pieces! Auntie died a very long time ago, so I’ll have to try to figure out how she made this baby (with my very rudimentary crochet skills). And I have to start now, or I don’t think I’ll ever get it done! SAL starts next Sunday night!